BERKELEY, CA: The Haas Institute at UC Berkeley Wednesday launched a new monitoring project that investigates and documents the power and influence of 10 mega corporations—which own hundreds of subsidiaries in the agriculture, food production, and sales industries—over the design of the global food system that has left millions of people around the world in hunger. “Shahidi: Corporations Decoded” documents corporations’ profits, track records on human rights, labor, and the environment; their congressional lobbying power and influence over government; identifies policy issues, bills, and government regulations which their lobbyists played a role in shaping; and lists their contracts awarded to provide services for federal government agencies. The 10 corporations profiled by the Shahidi project include Bunge, Cargill, Carrefour, McDonald’s, Monsanto, Nestlé, PepsiCo, Syngenta, Walmart, and Yum! Brands. “Our goal is to facilitate an open platform for communities, activists, researchers, policymakers, and other stakeholders to promote transparency and accountability in decisions over social and public goods, and to scrutinize and challenge corporate power,” Elsadig Elsheikh, the director of the Haas Institute’s Global Justice program who oversees the Shahidi project, said. Shahidi means "witness" in Swahili, and the name of the project speaks to the idea that the public must be able to observe and understand the root causes of the global food crisis to recognize the larger power structures at play. It arose out of a need to address the crisis in which 800 million people are estimated to suffer from hunger globally due to high prices and a lack of accessibility to food. The world produces more than enough food to feed everyone, with global food production increasing at a rate twice that of the global population over the past two decades. But control of global food prices by a handful of corporations—through lobbying, international free trade agreements, and other forms of influence over government—are putting people’s lives at risk for the sake of profits. 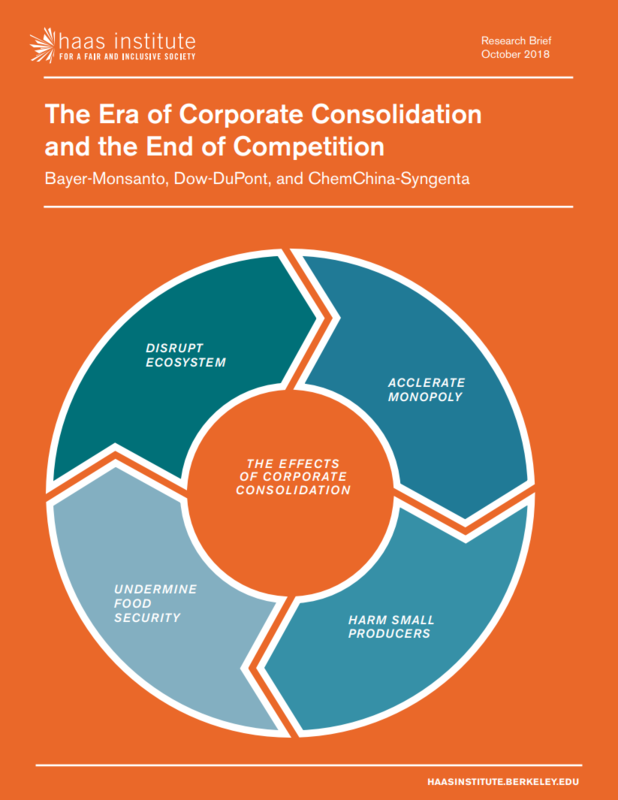 And the crisis is only getting worse due to corporate consolidation and concentration of power, such as with the recent mergers between Bayer and Monsanto; Dow and DuPont; and ChemChina and Syngenta. A research brief about the implications of those three mergers on the global food system was also published today, and can be found on this page. On the Shahidi project website, the 10 companies’ activities are mapped out using interactive features where users can navigate between tabs that offer company profiles, a world map that shows the countries where they operate, specific congressional bills their lobbyists campaigned for or against, the schools or universities to which they made financial contributions, the income disparities between the CEO and lowest-wage workers, lists of companies’ brands, and descriptions of controversies that involve them. For example, the Shahidi project website reveals that Bunge, a US-headquartered agribusiness and food company, collected a total revenue of $45.79 billion for fiscal year 2017. The company’s activities accounted for the deforestation of 567,542 hectares in Brazil’s Cerrado region between 2011 and 2015. Bunge was also listed as one of the primary forces—along with Cargill—behind deforestation in Latin America for soybean cultivation. In 2006, Bunge reached a $13.9 million settlement with the US Environmental Protection Agency for air pollution. The company has been awarded more than 1,000 government contracts with the Department of Agriculture since 2008, has invested in at least 18 schools and universities including $170,000 in Harvard University toward Research and Development, and lobbied for at least 81 congressional bills that deal with agriculture, labor, financial markets, and other issues since 2006. The website lists 20 of Bunge’s lobbyists or former lobbyists by name. The CEO of Bunge receives an annual salary of $10.8 million, compared to $20,800 for the lowest paid employee, a ratio of 517-to-1, the Shahidi project website reveals. Data for the project was collected from various sources, including filings by the Securities and Exchanges Commission, Freedom of Information Act documents that included communications between the corporations and federal agencies, and other public records. The Shahidi project website and an explainer video of the project that breaks down the invasive role of multinational corporations in the global food crisis can be accessed at http://haasinstitute.berkeley.edu/shahidi.